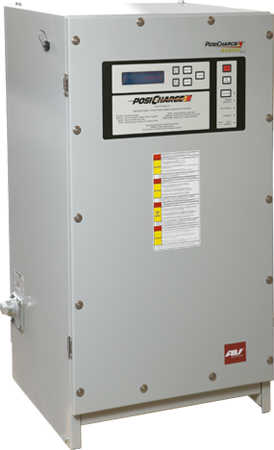 PosiCharge™ systems bring you industry-leading fast charge solutions for airport ground support equipment, outdoor-rated to withstand extreme conditions. Looking for Forklift Chargers? Switch to the eMHE Product Selector. Sea-Tac airport is one of our customers that invested in a GSE electrification project. Watch how much they’re projected to save yearly. Posicharge SVS100 is a compact charger and a great fit for a variety of electric airport ground support equipment that require fast or opportunity charging. Typical customers for this charger include regional jet organizations, GA and FBO airport operators, and other non-hub maintenance and logistics companies. The SVS100 is outdoor-rated to withstand extreme environmental conditions. The SVS100 can provide up to 10kW of power in a single port, which is ideal for electric belt loaders, baggage tractors and other electric equipment that are not under extremely heavy use or demand fast charging. Our unique technology utilizes battery voltage and temperature sensors to accurately control the charging profile, adding an unparalleled layer of efficiency and safety. The SVS100 features IGBT technology for high performance and reliability. And like all Posicharge chargers, the SVS100 works with a broad range of battery voltages, types, and capacities for virtually any vehicle application. In addition, the chargers also capture the data required to analyze and manage individual and fleet vehicle battery status and usage. Airports are challenged to operate clean electric GSE in response to increasingly tougher federal air quality regulations. Internal combustion engine GSE impose health hazards for workers and has economic impact on company’s bottom line due to increased workers’ compensation claims and medical costs. eGSE batteries need to be charged around-the-clock. Limited utility infrastructure and physical space. PosiCharge fast charging technology is an intelligent system designed to maximize available electrical infrastructure, keep fleet operational 24/7 and extend battery life. Charge three times the equipment with the same power you were using for conventional chargers.